This audit of the fiscal year 2012 was extended into 2013 and then published in 2014. After reviewing a draft of this report, the town board responded with a letter to the OSC in April of 2014. After the report was published, the town board placed a copy in the town files and placed the required notice in the back of The Walton Reporter in May. After reviewing the final report, the town board submitted the required Corrective Action Plan (CAP) to the OSC in July. 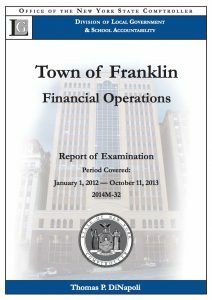 In all this time, there is no written record of this audit being discussed in the public meetings of the town board. Unfortunately, video-recording of the monthly meetings did not begin until later in December 2014. This is extraordinary. Though there is no law requiring that the town board inform the townspeople of an audit, this is the accepted common practice. Last year, the proposed bio-digester project for the Village of Walton was audited by the OSC. The resulting report was discussed at the April 2017 meeting of the mayor and trustees, and their discussion was covered in the next issue of The Reporter. In contrast, the Franklin Town Board kept its own council. In the last year, audits of local governments were done for towns of Colchester (financial condition), Walton (incompatible duties), Hancock (transfer station operations), and Sidney (budget review). In 2015, Delaware County was audited both for third-party contractual services and for vehicle usage and disposal. These boards kept their residents informed through monthly public meetings. The NY Open Meeting Law does require that the business of the town board be conducted in front of the townspeople, with a few exceptions. From the Public Officers Law, Article 7, §100, Legislative Declaration: It is essential to the maintenance of a democratic society that the public business be performed in an open and public manner and that the citizens of this state be fully aware of and able to observe the performance of public officials and attend and listen to the deliberations and decisions that go into the making of public policy. The people must be able to remain informed if they are to retain control over those who are their public servants. It is the only climate under which the commonweal will prosper and enable the governmental process to operate for the benefit of those who created it. The New York Department of State advises on compliance with the Open Meetings Law through its Committee on Open Government. In response to an inquiry by this newspaper, the committee rendered an advisory opinion of April 21, 2017 (OML-AO-5544) that the submission of an official CAP to the Office of the State Comptroller requires a motion by the town board. The minutes of the Franklin Town Board record no such motion. Our board, in continuing to avoid discussing the audit in front of the townspeople, violated this law. Under the OML, town boards may go into executive session to discuss some confidential matters. Topics that may be discussed in private are limited under the law and must be declared beforehand. Franklin Town Board went into executive session in April, May, and June (but not in July) of 2014 to discuss contract negotiation. No mention was made of discussing the audit. (This is just, as well as an audit is not a legal topic for an executive session according to COG.) What is more, any motions made in executive session must be recorded in the minutes. Supervisor Taggart and councilmen Grant and Sitts were in office when OSC issued its audit. Councilmen Bruno and Smith (Donald T.) were elected in November 2015. Our board did not use the opportunity of their past two years of dissembling to correct the lapses by the supervisor submitting the overdue financial reports (now totaling eight) and by the councilmen preforming annual audits. Instead, in the absence of pressure from the townspeople, our board continued business as usual. This secrecy is part of a long-standing pattern of governance by the Franklin Town Board. Before their monthly meetings, the lack of an agenda leaves we-the-people uninformed on what will be discussed. During meetings, the lack of periodic reports by appointed officials (assessor, code enforcement officer, etc.) leaves we-the-people uninformed of what their government has been doing. After meeting, the lack of postings to a website leaves we-the-people uninformed of what just happened. We have a board that informs its townspeople as little as is legally possible. More disturbingly, it raises the question: What else do we not know about decisions that our town board makes illegally outside of public meetings? Correction: In the spring issue, we misstated that Mr. Taggart was appointed supervisor before being elected in November of 2013. Therefore, Supervisor Smith (Donald M.) is responsible for failing to file annual financial reports for the years 2009, 2010, 2011, and 2012. Supervisor Taggart is responsible for the years 2013, 2014, 2015, and 2016. We regret the error.